An outstanding effort from DIS combined events athlete Ella Rush, left her with an unexpected Silver medal on the weekend in the National Under 17 Champs. Securing 4 PBs and an overall PB score of 3759 it was a weekend to be proud of. Ella commented “I was just aiming for solid performances, so to come away with a Silver medal and competing a year above is amazing. 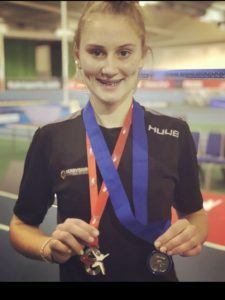 It leaves me really excited for whats to come!” This achievement for a 14 year old is outstanding and places her 5th on the all time U.17 rankings. We love Ella’s attitude at the Institute and the mentors and coaches she has around her, shes very humble and we look forward to seeing what this year brings. Great work Ella!